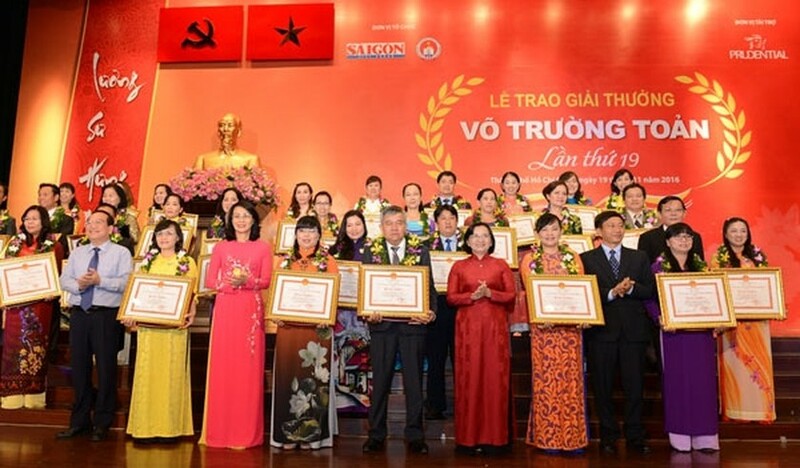 The 2016 Vo Truong Toan Awards were given to 33 outstanding teachers and teaching staffs in Ho Chi Minh City on November 19, marking Vietnam Teacher’s Day on November 20. Teachers who have innovative teaching methods and gained the trust and respect of colleagues, students and student's parents were selected from kindergartens, primary schools, secondary schools, high schools, vocational schools and colleges throughout the city. Speaking at the ceremony, Le Hong Son, Director of Department of Education and Training in Ho Chi Minh City, congratulated the teachers for their invaluable contributions. Head of the Department of Propaganda and Training of the HCMC Party Committee Than Thi Thu highly appreciated the meaningful award organized by the City Department of Education and Training, Saigon Giai Phong Newspaper and Life Insurer Prudential Vietnam for the last 19 years. Launched in 1998, the ‘Vo Truong Toan Award’ has been conferred on 570 teachers so far. They have overcome difficulties and challenges in working and living to be excellent examples for their colleagues and students. The aim of the award is to preserve culture and encourage educational sectors in the country. This year’s annual prize was also launched for the first time in the central coastal city of Da Nang.